Welcome to Nowak Rope Ltd. a family run business located in British Columbia, Canada. Because of our uncompromising commitment to quality and service, customers have come to rely on us for their wide ranging and special needs. 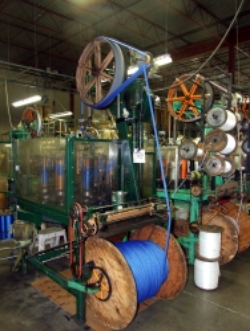 At Nowak Rope Ltd. we offer a wide range of products including starter cords, life lines, hollow braids and twines which are used in a variety of industries such as commercial fishing, recreational boating, industrial and hardware. No order is too small and we love a new challenge so if you’re looking for rope for a specific application and don’t see it on our website please contact us at Tel: 604.271.5004 or by email at sig@nowakrope.com and let us know what you need. Nowak Rope Ltd. can meet all of your rope and rigging requirements.